Have you had your heart set on installing dark wood floors in your home? Dark wood brings out a richness you simple can’t get with any other color. And if you mix up the darkness of the floor with a lighter, airiness to the walls and décor used to finish off the design, the look can be simply amazing. Yet one thing dark wood floors will guarantee you from the moment you lay them down is more time spent cleaning and maintaining them. They’re beautiful. But their dark color will show everything that hits the floor that isn’t supposed to be on the floor. Lint, dust, crumbs … it will all be far more apparent on a dark floor then it would be on a lighter color choice. The key to maintaining their beauty is to to keep them clean. What have others found successful? Because so much shows up on a dark floor, you will have to do more to keep the dust off the floors. Use a dust mop to pick up dust first. If you have a vacuum with a floor brush attachment, that can help pick crumbs up quickly. You can also invest in one of the newer dust products like Swiffer to help you quickly eliminate dust and dirt any time you choose. 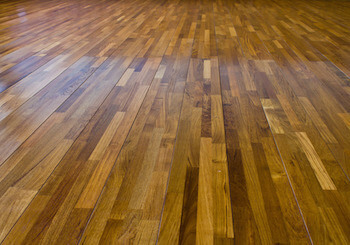 In most cases, your dark wood floors will be treated and sealed with a polyurethane finish or polyacrylic. Don’t use oils, sprays, waxes, furniture polish or any other chemical cleaner you’ll find in the cleaning aisle of your local big box store. Talk with your flooring contractor first about the perfect cleaning solution to help keep your floors looking their best for years to come. Use cleaning products and water sparingly. The key to water and wood is to not allow excessive contact for any length of time. If you use water on the floor, make sure you wipe it up almost immediately. Also, allow it to dry as quickly as possible to avoid potential warping. Because dark wood shows more of what’s on the floor, its important to keep things away that can do damage. All wood floors are easy to scuff and scratch; yet a dark floor will show the results easier. Be sure to take off shoes whenever possible, and always take off heels before walking across the floor. Attach felt protectors to the bottom of all furniture. You can also use rugs under areas where you’re most likely to have a lot of movement, such as under a kitchen table or in the dining room. You can also use mats at each entrance to your home. This encourages a place to take off shoes and leave them while moving around your home, and gives extra protection when entering from outside, where bringing in more dirt and weather elements is always possible.